I was looking for a new DSL modem and router as I am switching from cable to VDSL2. I was eyeing the Ubiquiti EdgeRouter series for a while because they have a big feature set at a reasonable price. I was a bit reluctant about the X series as they seem to be a bit troubled by their small flash memory and the Lite doesn’t have an SFP slot, which would have been nice for the fibre-to-the-home future. Also, both the X and the Lite have been available for quite a few years now, so I’m not sure how long they would have remained in firmware support. The 4 is much more expensive however, and I’d still need a VDSL2 modem, which seems to cost around 100€ (e.g. Draytek Vigor 130 or Allnet ALL-BM200VDSL2V). Of course, I could have gotten an off-the-shelf router with an integrated modem, like the AVM Fritz!Box series that’s very popular in Germany and probably paid less in total (standalone VDSL2 modems are rather expensive because not many people want/need them). I had a Fritz!Box on cable for the past few years and am not particularly happy with the quality of their firmware though. The hardware is great, however. So I decided to go with OpenWRT. The only built-in DSL modems it supports are Lantiq chips, so it had to be one from that list. I wanted something that has at least 64 MB of flash memory (so I could install some extra packages) and Gigabit Ethernet on all four ports. Luckily, OpenWRT recently got full support for the AVM Fritz!Box 3370. AVM announced that model back in 2010 and dropped official support for it in 2015, so they are available for ~25€ on eBay nowadays. Other models that would have been nice but are not currently supported by OpenWRT are the 3390 (simultaneous dual-band WiFi), and 3490/7490 (USB 3.0, 802.11ac, 512 MB flash memory and 256 MB RAM; the 7490 additionally has phone ports which can’t be used with OpenWRT). The ZyXEL P-2812HNU-F1 and P-2812HNU-F3 are quite similar to the AVM 3370, but they are not as readily available on eBay and tend to cost about twice as much. OpenWRT is now ready at 192.168.1.1 after a few minutes. Note that Fritz!Box 3370 support is not in the 18.06 release version, only in the current snapshot builds. This means that the luci web interface is not pre-installed and you should only install new packages within the first few days after flashing (so you don’t pick up newer packages incompatible with your firmware). After using the 3370 for a little while, unfortunately I noticed that it doesn’t handle more than around 60 Mbit/s. So be warned that it might not exhaust a 100 Mbit/s down, 50 Mbit/s up line. This seems to be due to a slightly underpowered CPU. This entry was posted in Linux, Networking and tagged openwrt on 2018-12-21 by Michael Kuron. I recently installed Debian 9 on a Seagate PersonalCloud. Because the device will only get backed up to once every day, I want its disk to be spun down when it’s not needed. Even on a minimal install, you’ll find quite a few background services that access the root disk every few minutes. Here is what I had to do to keep my disk spun down. Now systemctl daemon-reload && systemctl enable hdparm-sda && systemctl start hdparm-sda. Of course, we can’t have these messages written to a log if we want the disk to remain spun down, so edit /etc/crontab and comment out the hourly job. As long as /etc/cron.hourly is empty, this will not do any harm. If you have any hourly jobs, you might want to move them to daily jobs. Systemctl has its own cron-like timer mechanism. You can view active timers with systemctl list-timers --all and disable ones you don’t need, especially ones that run more than once a day. systemctl disable snapper-timeline.timer && systemctl stop snapper-timeline.timer. If you have Postfix installed, inotify will also show you that it periodically checks its queue directories. So uninstall postfix (apt-get remove postfix) and configure a forwarding MTA that does not run as a daemon. This last one was tricky to discover because it doesn’t appear in the logs and inotify doesn’t see it. You can logging of every disk access to the kernel log to see even more, but you need to disable syslog, otherwise you’ll get a self-amplifying write cascade. /var/lib/systemd/clock is used by systemd 234 and lower, while /var/lib/systemd/timesync/clock is used by systemd 235 and higher. So the latter will only be needed once you upgrade to Debian 10. This entry was posted in Linux on 2018-11-18 by Michael Kuron. At the university lab I work at, we usually get desktop computers with Intel Core i7 Extreme CPUs. They have more memory controllers and more cores than Intel’s mainstream CPUs, which is great for us because we do software development and simulations on these machines. Now that it was time to order some new machines, we decided to check out what AMD offers. The last time AMD’s Athlon series was competitive with Intel in the high-end desktop market was probably in the days before the Core i series was introduced a decade ago. Even in the server/HPC market, AMD’s Opteron series hadn’t been a serious Intel competitor after 2012. Now with the Ryzen, AMD finally has something that beats Intel’s high-end offerings both in absolute price and in price per performance. As prices on Intel’s high-end chips seem to have been increasing with every generation and after Intel didn’t handle the Spectre/Meltdown disaster very well at all earlier this year, we decided that it really was time to break Intel dominance in our lab. I would actually have liked to get something with a non-x86 architecture (because why not), but the requirement of eight CPU cores and four DDR4 memory channels ruled out pretty much everything. The remaining ones were either eliminated based on price (the IBM POWER9 CPU as in the Talos II) or because they are not available in the market (ARM in the form of the Cavium ThunderX2 or Qualcomm Centriq). The POWER9 and ThunderX2 actually have eight memory channels (the Talos’s mainboard only provides access to four though), as does the AMD Epyc (the server version of the Threadripper), so they or their successors might still become interesting options in the future. For comparison, Intel’s current Xeon Scalable series only has six channels, as does the Centriq. We decided to order a Threadripper 1950X with 16 cores. When I unpacked it and started my first benchmark simulation, I was pretty disappointed by the performance though. It turned out that the Threadripper is a NUMA architecture, but you need to toggle a BIOS option (set Memory Interleave to Channel) before it actually presents itself as such to the operating system. In its default mode, memory latencies are very high because a process might be running on a CPU core that is using memory on the other pair of memory controllers. The topology it presents in NUMA mode is roughly like this: out of the 16 cores, four cores each share a common L3 cache to make what AMD calls a core complex (CCX). Two CCXes together share a two-channel memory controller and sit on the same die. Two dies are interconnected with a 50 GB/s link. In NUMA mode and after setting the correct CPU affinity on my simulation processes (which is what the remaining sections of this blog post will be about), I was getting the expected performance — and as you might have expected, the Threadripper really is powerful. You can get something comparable from Intel, the Core i9 Extreme, but these chips are extreme not only in name but also in price. Also, I love the simplicity of AMD’s product lineup: the Ryzen series has two memory channels and 4-8 cores (i.e. one CCX), the Ryzen Threadripper has four memory channels and 8-16 cores (two CCX) and the Epyc has eight memory channels and up to 32 cores. Don’t bother with the second-generation Threadripper that were just announced: the 2920X is almost identical to the 1920X and the 2950X to the 1950X. The 2970WX and 2990WX are really odd chips: they have four CCXes (like the Epyc), but two of them don’t have their own memory controllers. So half of these chips would be as fast as my 1950X in NUMA mode, and the other half would be slower than my 1950X in its default mode. Usually, you only have to worry about CPU pinning and process affinity on servers, high-performance compute clusters and some workstations. Since AMD introduced the Opteron and Intel introduced the Core architecture, machines with multiple processor sockets have been associating memory controllers with CPUs in such a way that memory access within a socket was fast and between sockets was slower. This is called NUMA. To minimize inter-socket memory accesses, you need to tell your operating system’s scheduler to never move threads or processes between cores. This is called pinning or affinity. On servers, it is usually taken care of by the application, while on HPC clusters the admin configures the MPI library to do the right thing. The Threadripper is probably the first chip that brings NUMA to the desktop market. so that processes are pinned (bound) to a NUMA domain (usually that’s a socket, but in the Threadripper it’s a die with two CCXes). The second variable tells OpenMPI to create (map) processes on alternating NUMA domains — so the first one is put on the first die, the second one on the second die, the third one on the first die, and so on. You can also use the -bind-to core and -map-by core command-line arguments to mpiexec/mpirun to achieve the same. Using l3cache instead of numa may actually get you some even better performance because latencies within a CCX are lower than between CCXes within a die, but that only gains you a few percent and requires that you use more processes and less threads, which may be suboptimal for some software. 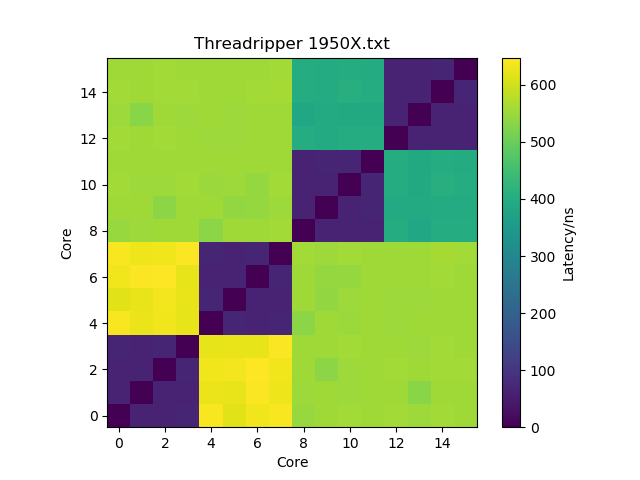 Below is an interesting figure about latency between cores, as measured with this tool (I’m not sure about the yellow squares though — I would have expected them to be more turquoise, and they don’t seem to match what I observe in actual performance). to get pinning. The process creation already happens on alternating domains by default. I like to put these variables in a file in /etc/profile.d so that they are automatically set for everyone who logs into these machines. I didn’t know this before, but both the GNU and the Intel OpenMP library will only create one thread for each core from their affinity mask, so you don’t even need to set OMP_NUM_THREADS=8 manually if you are running hybrid-parallelized codes. Update 2019-01: Updated the Jinja template to work correctly on non-16-core Threadrippers. These have one (12-core, 24-core) or two (8-core) cores disabled on each CCX, which results in non-consecutive core IDs. This entry was posted in Linux and tagged cpu, htcondor, mpi, openmpi on 2018-09-08 by Michael Kuron. Hypervisors like VMware Workstation, VMWare Fusion or VirtualBox usually offer three kinds of network interfaces: bridged (to a network on the host), NAT (sharing an IP address with the host via network address translation) and host-only (a connection exclusively between host and guest). VMWare, at least on Linux, realizes NAT entirely in the kernel, using standard IP forwarding and setting up a DHCP server on the host that gives addresses to the guest. VirtualBox, on the other hand, handles NAT entirely in user-space, meaning all packets entering and leaving the VM really seem to be going to and from a process named VBoxHeadless or similar. This entry was posted in Linux, Virtualization and tagged iptables, virtualbox, vmware on 2018-03-11 by Michael Kuron. _msdcs.example.com. 86400 IN NS dc01.example.com. _msdcs.example.com. 86400 IN NS dc02.example.com. _sites.example.com. 86400 IN NS dc01.example.com. _sites.example.com. 86400 IN NS dc02.example.com. Then on all your machines, use the BIND server as DNS server (typically set via DHCP option 23). For Windows Domain matters, only records below _msdcs and _sites are ever looked up. I believe you should even be able to point your domain controllers to the BIND DNS server — they should be able to follow the NS record so that whenever they try to update their own records, they do so on the Microsoft DNS server. As it turns out, the RFC 2136 DNS UPDATE method is used when domain controllers try to register their own records, so you’ll see error messages in your logs if you point your domain controllers to the BIND DNS server (on a Microsoft DC, these would refer to NETLOGON and dynamic DNS registrations, while on a Samba DC they would be about samba_dnsupdate). If you are running Samba 4.5 or higher, you should ensure that samba_dnsupdate is called with the –use-samba-tool flag, which can probably be done by setting the option below in your /etc/samba/smb.conf. If you are running an older Samba version or any Windows Server version, you need to resort to using your domain controllers’ IP addresses as DNS servers on on all domain controllers (Samba: put them into /etc/resolv.conf, Windows: set them in the network interface properties). _ldap._tcp.example.com. 86400 IN CNAME _ldap._tcp.dc._msdcs.example.com. _gc._tcp.example.com. 86400 IN CNAME _ldap._tcp.gc._msdcs.example.com. _kerberos._tcp.example.com. 86400 IN CNAME _kerberos._tcp.dc._msdcs.example.com. _kerberos._udp.example.com. 86400 IN CNAME _kerberos._tcp.dc._msdcs.example.com. The _kpasswd records unfortunately can’t be CNAMEs because they don’t exist in the _msdcs branch, so you manually need to keep them up-to-date when you add and remove domain controllers. This entry was posted in Linux, Networking, Windows, Windows Server on 2016-09-18 by Michael Kuron. If your SMB server is running Samba, the user you specify (foo) must not exist on the server so you force it to use anonymous authentication. With a Windows server, things might be different. That should give you a working installer that will get your Windows running within a few minutes because Gigabit Ethernet has a much bigger bandwidth than a spinning DVD or a cheap USB flash drive. Serva did have one advantage, however: when you set it up, you could inject network drivers into the boot image. With Windows 10, luckily, that has become a non-issue: Microsoft releases a new installer ISO for it about once a year, which you can directly download and which should contain all drivers for the latest hardware available when it was released. This entry was posted in Linux, Windows and tagged PXE on 2016-09-04 by Michael Kuron. 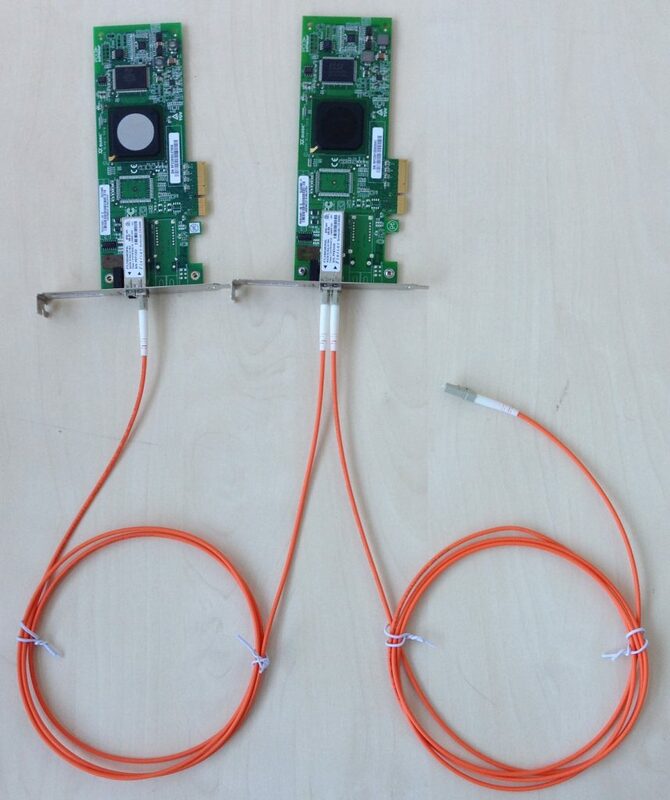 We have a small Fibre Channel SAN with three servers, a switch and a dual-controller RAID enclosure. With only a single switch, we obviously couldn’t connect all servers redundantly to the RAID system. That meant, for example, that firmware updates to it could only be applied after shutting down the servers. Buying a second switch was hard to justify for this simple setup, so we decided to hook the switch up to the first RAID controller and wire a loop off the second RAID controller. Each server would have one port connected to the switch and another one to the loop. Back in the old days, Fibre Channel hubs existed for exactly this purpose, but nowadays you simply can’t get them anymore. However, in a redundant setup, you don’t need a hub, you can simply run cables appropriately, i.e. in a daisy-chain fashion. The only downside of not having a hub, the loop going down if one server goes down, is irrelevant here because you have a second path via the switch. For technical details on the loop topology, you can have a look at documentation available from EMC. These cables are somewhat exotic, so your usual cable dealer might not have them, but they exist and are available from specialized fiber cable dealers. 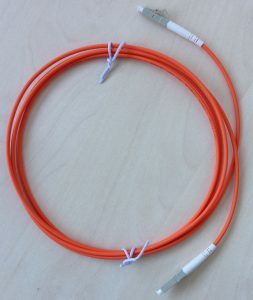 As you are wiring in a daisy-chain fashion, you need one simplex cable per node you want to connect. How can you tell the output side from the input side? Some transceivers have little arrows or have labels “TX” (output) and “RX” (input). If yours don’t, you can recognize the output side by the red laser light coming from it. To protect your eyes, never look directly into the laser light. Never connect two output sides together, otherwise you may damage the laser diodes in both of them. Therefore, be careful and always double-check. That’s it, you’re done. All servers on the loop should immediately see the LUNs exported to the by the RAID controller. In my setup however, further troubleshooting was required. The loop simply did not come up. As it turns out, someone had set the ports on one FC HBA to point-to-point-only and 2 Gbit/s mode. After switching both these settings to their default automatic mode, the loop went up and data started flowing. My HBAs are QLogic QLE2462 (4 Gbit/s generation) and QLE2562 (8 Gbit/s generation), and they automatically negotiated the fastest common speed they could handle, which is 4 Gbit/s. Configuring these parameters on the HBA usually requires hitting a key at the HBA’s pre-boot screen to enter the configuration menu and doing it there, or via vendor-specific software. I didn’t have access to the pre-boot configuration menu and was running VMware ESXi 6.0 on the servers. The QConvergeConsole for my QLogic adapters luckily is also available for VMware. It is not as easy to install as on Windows or Linux, unfortunately. You first install a CIM provider via the command line on the ESXi host, reboot the host and then install a plugin into VMware vCenter server. This entry was posted in Linux, Uncategorized, Virtualization and tagged esxi, fc, fc-al, fibre channel, fibrechannel, loop, qlogic on 2016-06-03 by Michael Kuron. Multicast audio now works and it even goes across the VPN. Interestingly, you don’t even need to set the rtp_codec_type setting — the phone automatically determines the codec from the stream. I wasn’t able to get the Opus codec working though, the phone just makes crackling noises when I tried. This entry was posted in Linux, Networking, VoIP and tagged openvpn, sip, snom, voip on 2016-03-12 by Michael Kuron. I have a first-generation Clamshell iBook, manufactured in January 2000. These shipped with 64 MB of on-board RAM, a 6 GB hard drive and a CD drive. I got it in summer 2005 when my high school decommissioned these computers. Running Mac OS X 10.3.9 at the time, it was still a very usable computer, especially after I upgraded the RAM to 320 MB. I used it as my main computer for a year and a half, until I replaced it with a new Intel-based Mac. Now, in 2016, I found a 40 GB IDE laptop hard drive and decided to put that into the Clamshell and try to make it usable again. As usual, iFixit has a good tutorial. You have to take the entire machine apart and end up with around 50 screws, but it’s surprisingly easy. You only need a Torx T8, a Philips #1 and a 5mm nut driver. Now, on to putting some operating systems on the hard drive. Mac OS X 10.3 retail install CD (the first one is sufficient). Any other bootable Mac OS X 10.3 CD might also work. Officially, Tiger is only supported on the latest revision of the Clamshell iBook, which has FireWire and a DVD drive. Mine only has a CD drive and does not support USB booting, which makes things exceedingly difficult. Take an image of the 10.4 install DVD and save it onto the USB hard drive using a different Mac. Open up Disk Utility. Partition the disk with the following sizes and names: 16 MB linux-boot, 2 GB linux-swap, 12 GB linux, 20 GB Macintosh HD, 6 GB Install. Make sure to select the Install OS 9 drivers checkbox. Plug in the USB hard drive. Clone the 10.4 install image onto the Install partition on the internal drive. Open a Terminal and bless the hard drive: bless --folder "/Volumes/Install/System/Library/CoreServices" --bootinfo "/Volumes/Install/usr/standalone/ppc/bootx.bootinfo". Using the Terminal, pico /Volumes/Install/System/Installation/Packages/OSInstall.mpkg/Contents/OSInstall.dist and remove the PowerBook2,1 from the badMachines list. Open Startup Disk and set the iBook to boot from the Install partition. Install 10.4 onto the Macintosh HD partition, deselecting all printer drivers and languages you don’t need in order to save some space. After the reboot, run Software Update a few times. Mac OS 9 CD or image. You can get an image from the NetBoot for Mac OS 9 download page. Mac OS 9 is really easy to install, you just copy it to the hard drive. Mount the CD or image and copy System Folder and Applications (Mac OS 9) from the root directory to your Macintosh HD. Open the Startup Disk preference pane and select Mac OS 9.2.2. If you used the NetBoot image, you will be asked for user name and password. Use NBUser and netboot. In order to disable the password prompt, go to the hard drive, System Folder and move the contents of Control Panels disabled to Control Panels. Now open the Multiple Users control panel, go to options and set it to local authentication. Then, disable multiple users entirely. Download and install QuickTime 6.0.3 for Mac. Open the Startup Disk control panel and select Mac OS 10.4. After the reboot, open the Classic preference pane and select the system folder on Macintosh HD. Now you can use Classic and you can also do a native boot. Mac OS 9.2.2 hasn’t received updates in almost 15 years, and Mac OS X 10.4 is also 7 years beyond its update cycle. So how about a current operating system? Debian 8 PowerPC install CD. Download and burn the ISO from the Debian FTP server. Except for the partitioning, the installation is quite straight-forward. Insert the CD and boot it by holding the C key while turning on the computer. When asked for the partitioning, set the 16 MB partition to be NewWorld Boot and set the bootable flag. Set the 2 GB partition to be swap. Set the 12 GB partition to be ext3 and mounted at /. When asked for the packages to install, choose the Xfce desktop. It’s lightweight enough to run on this old hardware. After rebooting, run nano /etc/apt/sources.list and add the non-free repository to all entries in the file. Then, install the AirPort firmware: apt-get install linux-firmware-nonfree. Fonts are a bit messed up. Bitmaps are drawn to the screen just fine. I’m still looking for solutions to these two things. Right now, your computer will boot into Linux all the time. While the yaboot loader prompts you to hit x to boot into Mac OS X and m to boot into Mac OS 9, that doesn’t work as expected. Instead of booting into Mac OS X, my iBook booted into the install partition. And instead of booting into Mac OS 9, my iBook booted into Mac OS X. So run nano /etc/yaboot.conf and adjust the macosx= line so that it refers to the same partition as the macos9= line. Exit the editor and run ybin -v to apply the changes. That fixes the first problem. Now, reboot into Mac OS X and open the Startup Disk preference pane. Select Mac OS 9.2.2 and reboot. While rebooting, hold down the option key and select the Linux partition at the boot picker. Run nano /etc/yaboot.conf again and add brokenosx to a new line. Once more, run ybin -v.
Now, each boot loader entry does what you’d expect. The trick here is that brokenosx causes yaboot to directly load the Mac OS X booter for the macosx= entry. The macos= entry, on the other hand, will still cause the blessed system folder to be booted. One problem is still there: When you try to boot Mac OS 9, you are greeted by a blinking floppy with a question mark. This happens because the Debian partitioner destroys the Mac OS 9 drivers for the HFS+ partitions. However, the drivers can be reinstalled. Mac OS 9 install CD. Any other bootable Mac OS 9 CD might also work. Insert the CD and reboot the iBook while holding down the C key. Open Drive Setup, highlight the internal hard drive, go to the Functions menu and click Update Drivers. http://ppcluddite.blogspot.de/2012/03/installing-debian-linux-on-ppc-part-iv.html is an excellent article that explains how to fix most issues that Debian has on PowerPC. For example, to fix the font rendering troubles, create an xorg.conf file (switch to a text terminal, run init 3, Xorg -configure, cp /root/xorg.conf.new /etc/X11/xorg.conf) and insert Option "RenderAccel" "false" into its Device section. This entry was posted in Linux, Mac and tagged apple, ibook, linux, mac os 9, mac os x on 2016-02-07 by Michael Kuron.